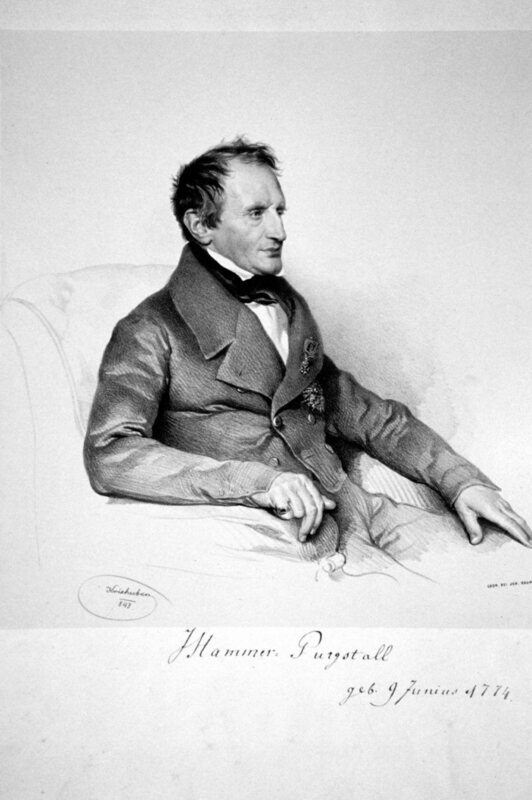 Lithograph portrait of Joseph von Hammer-Purgstall, by Josef Kriehuber, 1843; image accessed from Wikimedia Commons. Bey den Pferden, die im Wettlaufe rennen! Der Mensh ist gegen seinen Herrn undankbar! Er selbst bezeugt es als wahr. Weiss er den nicht dass an jenem Tag der Herr har auf Alles Acht? Und dringen in des Heeres Mitte! Und liebet heftig seinen Nutz. Daß nichts von ihnen ihrem Herrn dann bleibt versteckt? Which of the above German translations is more successful? Why? Why might German translators be more apt to pay attention to rhyme than translators working in other European languages? There is another peculiarity which is disconcerting in translation though it proceeds from one of the beauties of the original, and is unavoidable without abolishing the verse-division of great importance for reference. In Arabic the verses are divided according to the rhythm of the language. When a certain sound which marks the rhythm recurs there is a strong pause and the verse ends naturally, although the sentence may go on to the next verse or to several subsequent verses. That is of the spirit of the Arabic language; but attempts to reproduce such rhythm in English have the opposite effect to that produced by the Arabic. Here only the division is preserved, the verses being divided as in the Qurʾan and numbered. Are attempts at “rhythm” in English translations of the Qurʾan really so doomed to failure as Pickthall suggests? Is there something about the English language that makes it especially ill-suited to rhyming translation? Or are Pickthall and the others simply being obtuse or myopic? * Devin Stewart is Associate Professor of Arabic and Middle Eastern studies at Emory University.© International Qur’anic Studies Association, 2015. All rights reserved. For the IQSA 2015 Annual Meeting in Atlanta, the Qur’an: Manuscripts and Material Culture program unit will host two panels. For the first panel, we invite papers that deal with all eras and regions of the Qur’an’s manuscript tradition, as well as the variety of palaeographic, art historical, codicological, and historical issues one encounters in the discipline. For example, a paper topic may focus on a particular manuscript or group of manuscripts, a feature of orthographic development, a particular script style, the dating of manuscripts, issues of textual criticism, systems of qira’at, the Qur’anic arts of the book, or another feature of Qur’anic manuscript studies not listed here but that fits the general parameters of the program unit. For the second panel, we invite contributions on any aspect of the Qur’an’s history and pre-history that lies outside the manuscript tradition. The second panel aims to provide a forum for the study of the Qur’an as it was applied to objects of daily use as well as elite artifacts and buildings, and for the investigation of scholarly reactions to these developments in hadith collections and other textual sources. For example, topics relating to Qur’anic citation in the epigraphic (including graffiti as well as formal inscriptions), architectural, ceramic, numismatic and papyrological records and the use of the Qur’an in funerary, apotropaic, and prophylactic contexts would be most welcome. Topics concerning pre-Islamic inscriptions that might have a bearing on the later formulation of the text of the Qur’an are also welcome. Proposals should include a title and an abstract of approximately 400 words. Click here to submit a proposal to the Qur’an: Manuscripts and Material Culture program unit. Click here to view the complete IQSA 2015 Annual Meeting CFP. Over the past fifteen years, there has been a tremendous upsurge of interest in the historiography of late antique Arabia. This has happened as a result both of targeted studies as well as developments in late antique historiography more broadly. New studies authored or edited by Glen Bowersock, Averil Cameron, Greg Fisher (including work with Jitse Dijkstra), Robert Hoyland, and Christian Robin have contributed to a better understanding of a number of historical issues. These include the relationship of Arabia to its neighbors; the archaeology and history of different groups of people in the Arabian Peninsula; links between different communities, especially religious communities; alliances managed by Romans, Persians, and Himyarites with Arab clients; and the development of Arab “identity” prior to the seventh century. 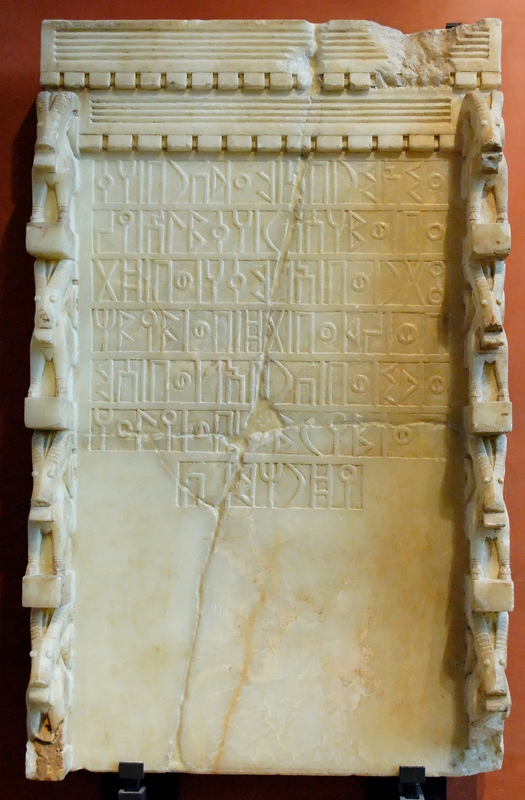 Votive stele of alabaster with Sabaean inscription adressed to the moon-god Almaqah, ca. 700 BC, Yemen; held in the Department of Oriental Antiquities, Louvre Museum, Paris. Image accessed from Wikimedia Commons. Over the same period, Qur’anic studies has developed in significant ways as well, particularly regarding the investigation of the literary compositions and religious discourses that may have provided the horizons and context of the emergence of the Qur’anic revelation. The Qur’an and Late Antiquity program unit, the newest in IQSA’s Annual Meeting lineup, seeks to promote knowledge of developments in Late Antique studies among scholars of the Qur’an and developments in Qur’anic studies among scholars of Late Antiquity, particularly in order to encourage better integration of these fields in the future. Our remit includes not only pre-Islamic Arabia and its immediate environs, but also the larger frame of late antique history, culture, religion, society, and politics in the Near East and Mediterranean regions as it may illuminate the background to the rise of Islam and its broad, long-term consequences. The Qur’an and Late Antiquity program unit focuses on investigation of and critical reflection on the historical context in which the Qur’an was revealed. We seek papers that illustrate significant textual parallels between the Qur’an and other literatures of Late Antiquity, especially those that contribute to a better understanding of the Qur’an’s place in its cultural, political, social, and religious environment. We also seek papers that interpret the rise of the Qur’anic community in a broader phenomenological, sociological, or historiographic context, whether that of pre-Islamic Arabian society or the Roman and Sasanian Empires that dominated the eastern Mediterranean and Near East in this period. Particular attention will be paid to such questions as processes of political consolidation and legitimation, construction of communal boundaries, and relationships between communities and polities. For the 2015 IQSA Annual Meeting in Atlanta (November 20-23), we will sponsor two panels. First, we invite paper proposals for a panel on recent developments in the historiography of Late Antiquity as it pertains to the Qur’anic milieu in pre-Islamic Arabia or the wider context of the Roman and Sasanian dominions. This panel will be co-sponsored by the AAR Traditions of Eastern Late Antiquity group. We especially encourage submissions that attempt to achieve a broader synthesis of cultural, political, and religious trends beyond the analysis and comparison of textual corpora. We also invite paper proposals for a panel to be co-sponsored with the SBL Religious World of Late Antiquity program unit. This panel, the first of two to be presented in consecutive years, will feature papers on the intersection of religion and violence in Late Antiquity as it pertains specifically to the Qur’an and the Qur’anic milieu. The panel takes as its inspiration Thomas Sizgorich’s groundbreaking work Violence and Belief in Late Antiquity: Militant Devotion in Christianity and Islam. We especially encourage proposals that engage Sizgorich’s work directly and explicitly, whether on a historical, thematic, or methodological level. Annual Meeting 2015 Call for Papers Now Open! The International Qur’anic Studies Association announces the call for papers for the 2015 Annual Meeting to be held in Atlanta, Georgia. The Annual Meeting dates are November 20-23, 2015. Each of IQSA’s six program units provides a detailed call for papers; all are available on the complete AM 2015 CFP page HERE. From the CFP page, you can click on the title of a program unit to be directed to an external link for further instructions on submission of proposals. For additional information about a specific program unit, you may contact the unit chairs. The paper proposal submission deadline is March 5, 2015. IQSA welcomes your submission and looks forward to an exciting program in Atlanta!